One of KBS’ main advantages is its inbuilt ability to handle automatic, hands-free fax and email transmission of documents to customers, suppliers and other parties seamlessly with the minimum use of paper and the expensive handling involved. Not only is it productivity enhanced, but the process of placing and placing orders is sped up and the possibility of errors is reduced. 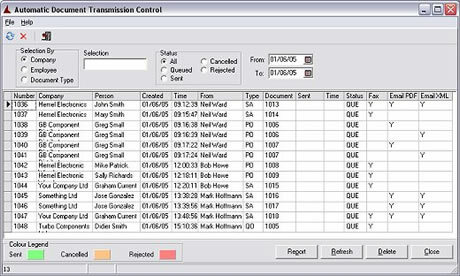 KBS Despatcher is innovative and comprehensive software, written by Kingston Developments, which monitors the database and formats documents as requested by users, including Quotations, Requests for Quotation, Sales Order Acknowledgements, Purchase Orders, Invoices, Remittance Advices, and Customer Statements. Once created, Despatcher will send each document to the requested recipient in the format specified, for example by Fax or Email. Documents may be printed, if required. The process is seamless; the software has access to the whole database and can inform users of any problems encountered. Despatcher maintains status of each transmission and logs date and time. Failures will be retried, up to the limit set by the user. Transmission status is each displayed or printed for remedial actions to be put in place. Documents may be reprinted at any time simply by selecting the document type and document number. KBS will print the latest status of each document. Despatcher saves time and effort; it is more accurate and faster than using traditional manual methods or ‘bolt-on’ software. It provides a permanent trace and ensures all documents reach their destination in the fasted most cost effective manner. Integrated within KBS Windows not a third party product. Document status can easily be checked. Professional electronics documents without scanning or using third party software. User definable colours to highlight the documents status. Automatic resending of failed documents.